PE0232. NO NO NANETTE (Vincent Youmans, Frank Mandel, Otto Harbach & Irving Caesar), w.Percival Mackay Cond. Orig. London Palace Theatre Cast: Binnie Hale, Joseph Coyne, Seymour Beard, Irene Browne, George Grossmith, Jr, etc. ; plus additional songs by Hannan Dance Band, Joe Garber’s Orchestra, Benson Orchestra of Chicago, Savoy Orpheans, Mayfair Orchestra, etc. (England) Palaeophonics 124, recorded 1925, Complete, as Recorded, w.Elaborate ‘The Play’ 20pp. Brochure replete w.photos from the London production & facsimile of original brochure. “NO NO NANETTE is a musical comedy with lyrics by Irving Caesar and Otto Harbach, music by Vincent Youmans, and a book by Otto Harbach and Frank Mandel, based on Mandel's 1919 Broadway play MY LADY FRIENDS. The farcical story involves three couples who find themselves together at a cottage in Atlantic City in the midst of a blackmail scheme, focusing on a young, fun-loving Manhattan heiress who naughtily runs off for a weekend, leaving her unhappy fiancé. Its songs include the well-known ‘Tea for Two’ and ‘I Want to Be Happy’. During its pre-Broadway tour, NO, NO, NANETTE became a hit in Chicago, and the production stayed there for over a year. On 16 September, 1925, the show opened both on Broadway, then on 11 March, 1925 in the West End, running 321 and 665 performances respectively. Three touring productions were circulating throughout the U.S. when the Broadway production opened, starring Louise Groody and Charles Winninger. NO NO NANETTE was not successful in its first pre-Broadway tour in 1924. When the production arrived in Chicago, producer Harry Frazee re-cast the show with new stars, had the book rewritten and asked Youmans and Caesar to write additional songs. 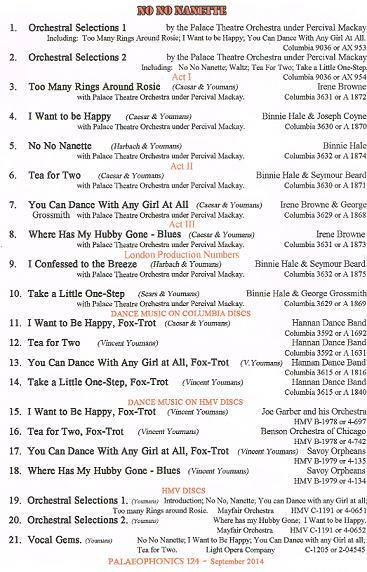 These additional songs, ‘Tea for Two’ and ‘I Want to Be Happy’ would become the hit songs of the show. Frazee eagerly capitalized on this success, but Broadway was not his first priority. 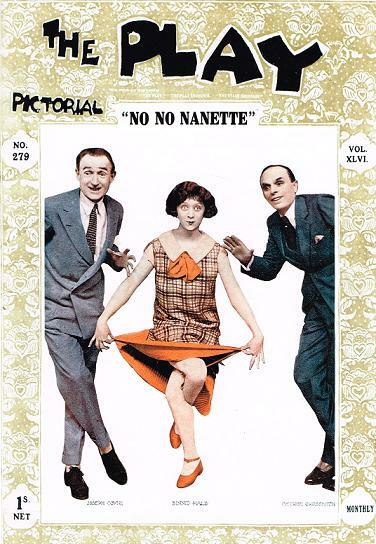 NO NO NANETTE starred Binnie Hale, Joseph Coyne and George Grossmith, Jr. and became a hit, running for 665 performances. The London production featured two songs that were not included in U.S. productions: ‘I've Confessed to the Breeze’ and ‘Take a Little One-Step’. It ran for 321 performances. Binnie Hale was probably the brightest and most successful star of the London musical comedy and revue stage during the ‘20s and ‘30s. This versatile and vivacious blonde actress, singer, dancer, and exceptionally gifted mimic, made her stage début in the musical comedy FOLLOW THE CROWD at the old Empire Theatre in 1916. Later that year she appeared in the revue WE’RE ALL IN IT at the same theatre, and then joined the chorus of HOUP-LA!, which opened C.B. Cochran’s brand new St. Martin’s Theatre. After being seen in a number of run-of-the-mill revues and musical comedies, including 150 POUND, THE KISS CALL, JUST FANCY, JUMBLE SALE, MY NIECES, KATINKA, PUPPETS, and THE ODD SPOT (1924), in the late ‘20s and ‘30s she excelled IN NO, NO, NANETTE (‘I Want To Be Happy’, ‘Tea For Two’, ‘I’ve Confessed To The Breeze’, ‘Take A Little One-Step’), Sunny (‘Who’, with Jack Buchanan) Mr. Cinders (‘Spread A Little Happiness, ‘I’m A One-Man Girl’, ‘Ev’ry Little Moment’ - the first of three shows with Bobby Howes), NIPPY, BOW BELLS, with her father, actor Robert Hale (‘You’re Blasé’, ‘Mona Lisa’), THE DUBARRY (as Jeanne in the UK tour), GIVE ME A RING, YES, MADAME? (‘Dreaming a Dream’), RISE AND SHINE, Cochran’s Coronation revue HOME AND BEAUTY (‘A Nice Cup of Tea’), and MAGYAR MELODY (1939). In the’40s, and for most of the ‘50s, she mixed appearances in pantomime (in her day, she was a superb principal boy) and variety theatres with more revues and musicals such as UP AND DOING, FLYING COLOURS, ONE, TWO, THREE! (with her younger brother Sonnie Hale), FOUR, FIVE, SIX!, OUT OF THIS WORLD, and THE PUNCH REVUE (1955). She also joined her brother in the radio series ALL HALE. Her last West End role is said to have been as the Duchess and Queen of Hearts in ALICE IN WONDERLAND at the Winter Garden Theatre in 1959. George Grossmith continued to appear in other producers' shows, including THE NAUGHTY PRINCESS (1920) and as Billy Early in Joe Waller and Herbert Clayton's original hit British production of NO, NO, NANETTE (1925). Around this time, Grossmith also worked as a programme advisor to the BBC, particular involved in comedy programming. He also negotiated on behalf of the BBC with theatre managers over their boycott on songs from plays, when provincial theatre managers had threatened to cancel tour contracts if excerpts from the new plays had already been broadcast by the BBC."